Go forward in time to January 2007. It will probably be available for GNOME 2.18. At least, I'll do my best to make it there. Otherwise, you will have it for sure in GNOME 2.20. Next tuesday I begin my trainee in Santiago, I am pretty excited about it! This is the place where the students of my Facultad have to lunch daily. There are no other cafeterias close to the campus, and we've been complaining about the lack of hygiene for a long time. But no one really cares. With you, our lovely cafeteria. This is what happens when people justify crimes in pro of a better society. I really wish this is not the real way most us-americans think. During the weekend I wrote a widget for EOG. 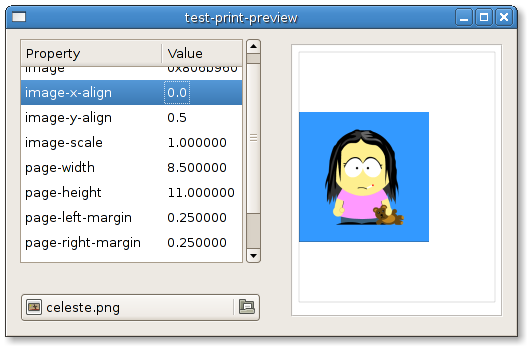 Here with you, the EogPrintPreview widget. 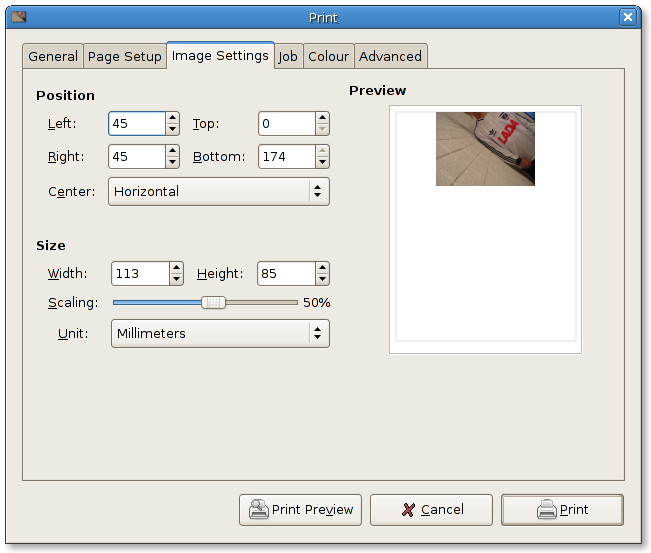 This widget shows how an image would look in a printed page, and lets the user drag the image using the mouse to place it wherever he/she want (inside the page margins, of course). Also, it adapts very well to any allocation, lets you set all the properties you may think of when it's about an image print in a page. The whole drawing is made with cairo, and as cairo is not as user-interaction-friendly as a canvas would be, I had to play a lot with maths to get it behave consistently. Nevertheless, the code is quite simple and I think it may fit for any image printing application. I am looking for a trainee place (práctica profesional) for this summer. Hopefully in Santiago, in a Software Developer or Software Engineer place on Unix/Linux systems, although I am open to other possibilities and/or places. I need to do this in order to fulfill part of the requirements to finish my studies. I can send my CV per request. If you know of any opportunity, please write me. Thanks. Last Saturday, Claudio, one of my best friends from childhood, got married. I went to Santiago for the weekend and had a great time on his wedding, with many of our old pals from high school. I am really happy and proud of him; and at the same time, I start to feel how chapters end up for a lot of my pals. Two close friends weddings this year so far; many of my mates defending their theses, and so on. I am probably getting older, as well. Go backwards in time to November 2006.